Memory procedures and emotional states function together. Affective tone permeates episodes of memory functioning. Memory functions centrally in episodes of emotional disturbance, serving to feed the episode with fuel from past events or to repress those events when one hopes to escape or avoid the episode. When cognitive procedures are impaired by emotional states such as depression and anxiety, people do not perform the tasks and achieve the goals that could help to repair their moods. 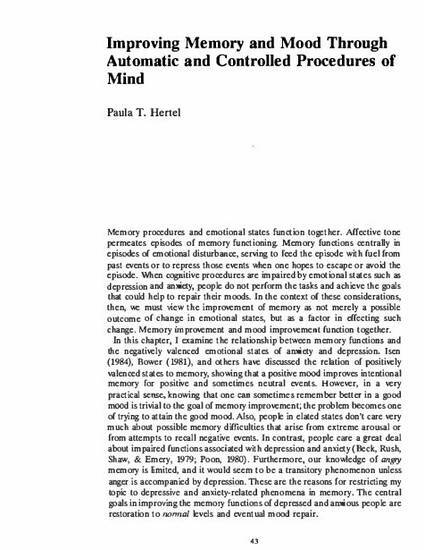 In the context of these considerations, then, we must view the improvement of memory as not merely a possible outcome of change in emotional states, but as a factor in effecting such change. Memory improvement and mood improvement function together.